ENJOY THE MAXIMUM COMFORT----The seamless and wirefree bra cup is deisgned to minimize the chafing, which offer you a sense of freedom. They are fitted with the knit-in wide elastic band printed with WingsLove logo at the bottom to reduce the bounce. And the two-ply construction provides you double protection. 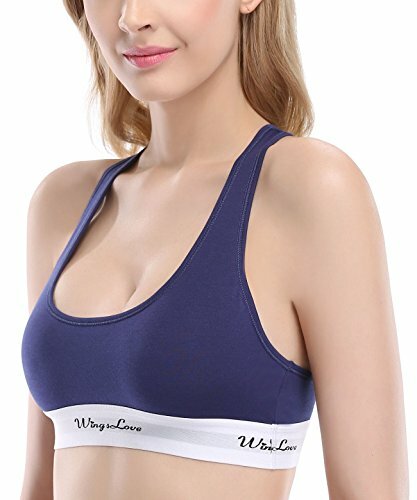 FUNCTIONAL USES----The wirefree bralette is good for the low impact sports, such as, walking, yoga, pilates, weight training,dancing, and gym workout. Meanwhile it can also be used for your bed time owning to the seamless and wireless bra design,which will offer you sense of safety without any uncomfortable. SIMPLE BUT FASHION----Wirefree bralettes are made in pure claissic colors such as Black, White, Grey and Navy blue. They are simple But classic. It can be easily matched with your other lingeries and clothing. Simple but can be extraordinary. Get one and create your own fashion. 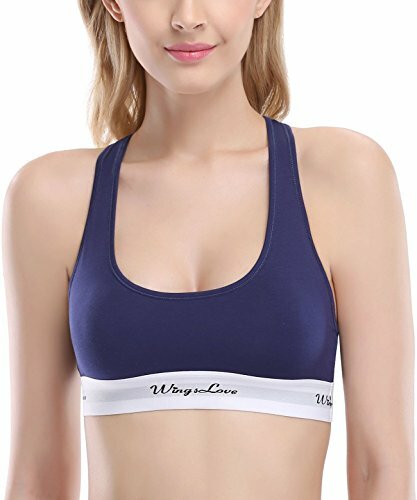 Comfort Cotton Bralettes suit for low-impact activities such as walking, yoga, pilates, gym workout and dancing. Design of Knit-in wide stretch elastic bottom band show out your Fashion&Sporty Feel. Seamless and soft cups design to minimize chafing, offer you maximum comfort. Pullover racerback straps relieve pressure on your shoulders also can be your ideal Bras for everyday's wearing.